Thread Addiction. I suffer from it. Do you? I’ve tried to overcome the problem, but I’ve discovered that it’s much more fun to talk to my support group (um, yes… that would be you) about threads than it is to try to kid myself out of my love for them. Well, you know what They say: All good things in moderation! Right? So let’s have a nice little moderate chat about a “new” (old!) thread on the market called Silk Gimp. “Gimp” is not really anything new. Gimp is simply cord. Silk gimp used in embroidery is not new, either. It’s been around for hundreds of years, was prevalent in 17th century embroidery, disappeared for a while, and has been recently resurrected and introduced to the needlework market. 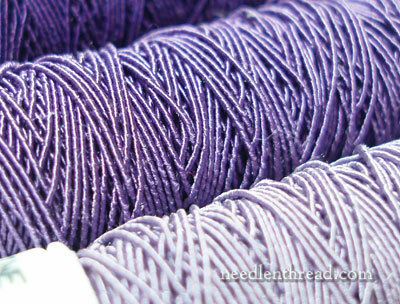 As an embroidery thread, silk gimp is unique, luxurious, and downright gorgeous. Silk gimp is a very fine, very special thread. Made from filament silk (it has a wonderful sheen! ), silk gimp consists of a silk core wound with a silk outer layer. This is silk gimp up close. It’s resting on a 40 ct linen. See the wraps? The silk core behind the purple is blue, and you can barely see a bit of it there, peaking through. Now, there’s the same silk gimp in the lower part of the photo. Above it is a #5 perle cotton, which looks comparatively huge. So, silk gimp is fine. 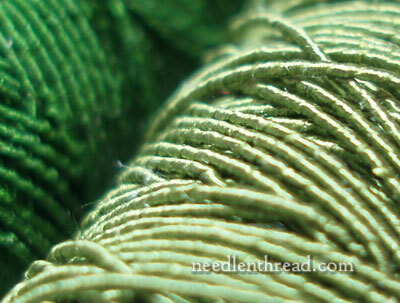 Here, you can see the center core thread in blue – it’s a small bundle of flat filament silk. The purple coiled thread above that is the outer layer of silk, which has been twisted and wound on the core, and still maintains its curly twist when it’s removed from the core. Silk gimp, then, is not like any other thread. It is thread-on-thread, and with it, you can create some very interesting effects that you wouldn’t get from regular thread, if you tried to do the same thing with regular thread. If you’re familiar with smooth passing thread used in goldwork (flattened gold wire wrapped around a core thread), you might see a similarity here. They are very similar, except that silk gimp lacks the wiry stiffness of gold passing thread. How is Silk Gimp Used? Well, now! That’s the fun question! While the thread has been resurrected for use in historical re-creation-type embroidery, I think that it has a place in the modern needlework market, even for those of us who are not primarily focused on faithfully re-creating historical needlework. 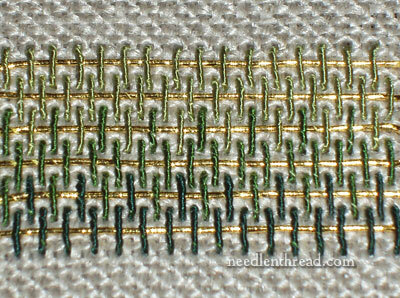 Silk gimp works very well couched, just like smooth passing thread in goldwork. But it can also be used for other types of stitching, such as detached filling stitches (detached buttonhole, trellis stitch, and the like) and other loop-type, lacing stitches (such as Pekinese stitch, interlaced herringbone stitch, laced backstitch, and the like). Admittedly, it isn’t the best thread for repeated surface stitching that requires passing through the fabric a lot, although it can handle some limited surface stitching when used carefully. To get the hang of using silk gimp – to see what it can do, how it looks when it does it, and how easy or difficult it is to do it – I decided to Play. I didn’t try every possible type of stitch – rather, whatever came to mind as I was sitting at the work table. 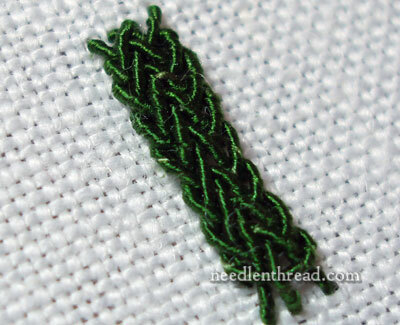 Since I have recently been playing with plaited braid stitch, and since I know plaited braid stitch is workable with smooth passing thread, I thought I’d see how it would work with silk gimp. 1. Never try to “sew” with the silk gimp. 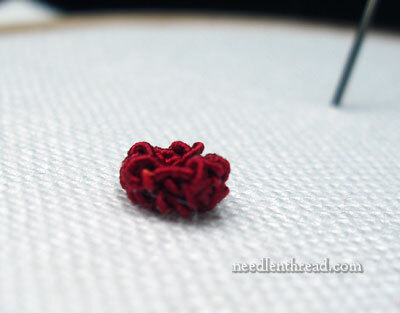 If you are working stitches that require you to pass into and out of the fabric, do so with the “stab” method, where you take the needle and thread all the way through to the back and all the way through to the front again. It also helps to enter the fabric with the needle perpendicular to the fabric – so, straight in, and straight out – rather angling the needle. 2. Use a needle that is larger than you think you need. You really want to open up the fabric for the gimp to pass through easily. Chenille needles work ok, but I preferred using a Japanese hand made needle (#13), because the smooth round eye is less likely to mar the thread where it passes through the eye. The plaited braid stitch was slow going with the silk gimp – but it did work, and I may explore this a bit further, later. 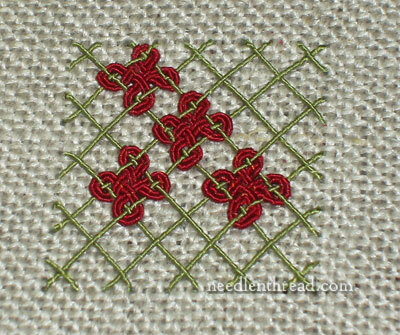 Because trellis work passes through the fabric very little, I stitched down a grid of interlocking trellis, just to see how it would look with the silk gimp. 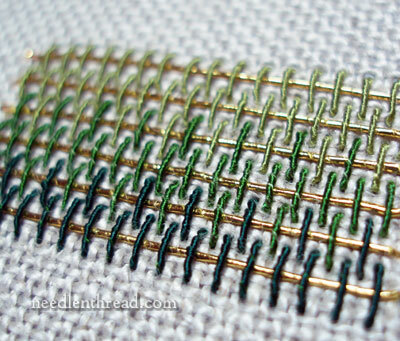 I like it a lot, and plan to play further with laid threads and laid thread fillings, as well as woven fillings. The interlaced maltese cross is very much like the interlaced herringbone stitch, only I’ve worked them here as single “units”, and the lacing is worked twice. I’m going to try the interlaced herringbone with the silk gimp, too – the thread takes these rounded, lacing movements really well. I suspect it will make Magnificent knotwork. This is burden stitch, above. Normally, the silk gimp would be the couchee, not the coucher, but in the example above, I used shades of green silk gimp to couch lines of imitation Japanese gold threads. The gimp makes the couching stitches almost look like very fine bullions. It’s really pretty in this application, I think! And because silk gimp comes in shade families, it works really well for this type of tecnnique! 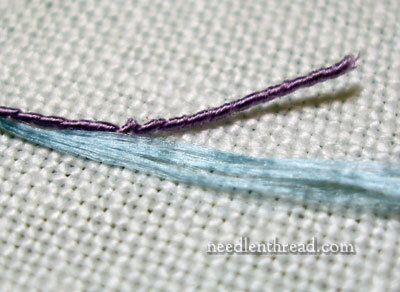 For some reason, I got it into my head to try raised cup stitch with the silk gimp. It worked. So definitely think in terms of stumpwork stuff for this thread! One of my most engrossing experiments with silk gimp involved a tree. I was just going to couch strips of gimp in the shade families they come in, and I probably will still do that for the fun of it, but I kept looking at the browns, which are Really Magnificent Browns, and … next thing I knew, I was couching silk gimp into a tree. Silk gimp and couching go together like bread and butter. This is my favorite use of the thread so far. 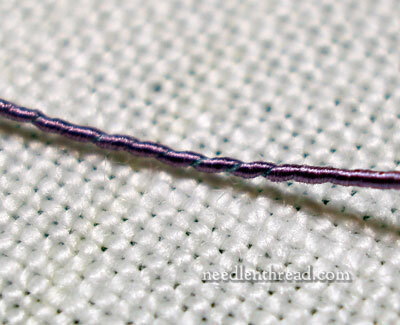 It’s so easy to couch this thread, and it looks terrific when couched! My mind is now a-whirl with all kinds of couchable ideas! Unfortunately, I’ve gone through the stuff like a bird slurping worms. For one thing, it did take time to get used to the thread, so there was a little waste involved in that process. And then, for another, once you start playing with this thread – wow! The ideas just keep coming! Where Can you Find Silk Gimp? Silk gimp is a glorious use of silk, and a unique, beautiful embroidery thread. 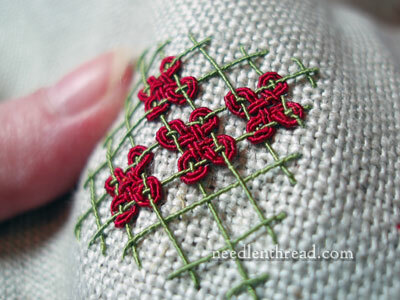 There’s really no other embroidery thread like it, and it produces a look that no other thread can produce. I’m hoping it’s going to be around to stay. Silk gimp is not on the market yet, so you can’t actually find it anywhere for sale right now. I’ve got my fingers crossed that we will see it begin to trickle out in 2013. Here’s hopin’! Hey, Mary, I just wanted to let you and everyone else know that when I clicked through to you Japanese needle post, the JEC store link was out of date. It can be found at jecstore.com now. Hi, Colleen – Thanks for the link! Thanks Mary for the clarification. I just saw “gimp” on her website and drooled over the colors. I will be mroe careful to look for silk versus viscose (rayon). Thanks again for the clarification. Wow, I am soooo jealous that you have got your hands on this collection already! I know that I will be getting mine as part of the Cabinet of Curousity supplies but I’m not sure when that will be. I think the PBS in silk gimp is a winner. 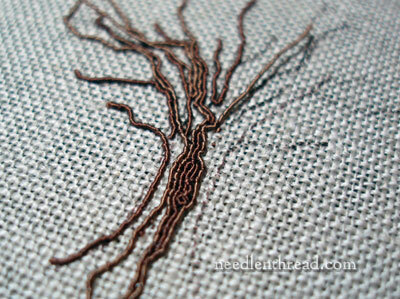 I love the burden stitch experiment and the couched silk gimp on the tree. I know historic embroiderers are thrilled that this thread has been reproduced but I also think that contemporary embroiderers will love it when they see it. I think Crazy quilters will go wild for it – the possibilities. Awesome introduction to silk gimp, which may just be the magic cord I’m looking for. I loved your samplings and can’t wait to get my hands on some. Mary, where did you get your collection? I didn’t see any at either of the links you gave. Did you have to special order yours? I did find it at Piper Silks. The exchange rate is something like 1.6+ X US dollar. I love the sheen to it. I’ve worked with gimp chord before, but it was cotton. This stuff is beautiful and I’d love to try working with it. I think you are feeding my addiction! I never heard of silk gimp until today, but I already know I love it! I can’t wait to try it! Your silk gimp tree is awesome! I’m loving it!! What a brilliant post. 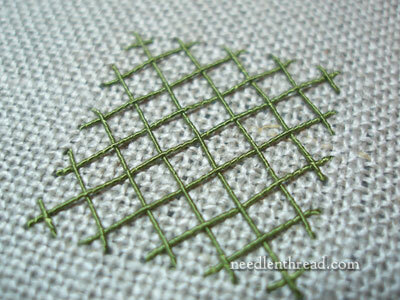 I love the green gimp thread it’s really rich and luscious, the combination of the trellis and the interlaced maltese cross stitches are beautiful. and I love the burden stitch (not heard of the stitch before) and the tree what a great way to create a tree. Brilliant Mary thanks for sharing this with us. I will definitely have to invest in this thread when it is more widely available. Ahhh, if only all suffering was equal to “thread addiction” what a wonderful world it would be. I am also addicted. 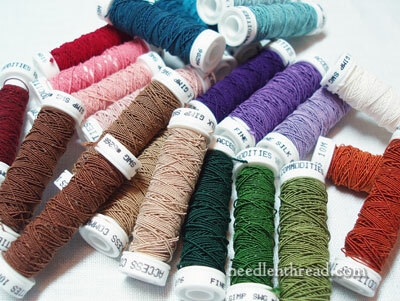 At one time – a least a million years ago- I thought if only I could own all all the colors of DMC thread that was available at the local dime store (at least 25 colors) Oh how happy I would be. Well, I met that goal and added more and more — but it makes me soooo very happy. Thanks for all the information you give us. I found this interesting Mary, mainly because my mother used to knit with gimp when she was young (probably 60 or 70 years ago). She made belts and small bags (more or less like evening bags). I went on a search for it a few years ago but couldn’t locate any. Nice to know it’s coming back! Speaking for Hedgehog Handworks, unless you are taking one of the Thistle Threads classes, the silk gimp probably won’t be available until March 2013. Hedgehog Handworks has every intent to stock this thread not just special order it. I’m happy to start a list of people who are interested in purchasing the gimp when it becomes available. You can send an email through the “Contact Us” link on http://www.hedgehoghandworks.com You will be the among the first to know of its availability. Thank you for the post on silk gimp! The tree is si onteresting…and you just solved a problem that has been brewing for a long while on a project waiting in the wings. Now I know what to do on my “tree” trunk. Thanks for keeping us all up to date own what is new! wow very interesting product, I would love to hear more about this kind of stuff! 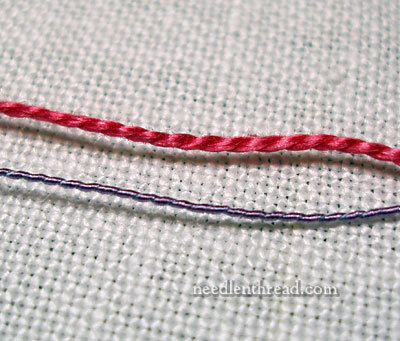 Your post reminds me, I have been looking for modern reproductions of buttonhole twist silk thread, particularly the size D kind I found in my grandmother’s sewing box. It appears to be not made anymore, are you familiar with it, and could you recommend any similar products if you are? What a fabulous post. I had a teeny, weeny play with the gimp a few weeks ago but reading this convinces me I have much, much more playing to do! Love, love, love the tree. Oh no! Another thread for me to get addicted to! This is simply beautiful, so I will definitely have to buy some. I love that tree, I’m itching to stitch some leaves onto it. Of course, I just love anything made of silk. Phew, this stuff is amazing. How gorgeous can it get. Mary I think this tree is so adorable. Can’t wait to learn this one. quel blog magnifique!! !je me regale de vous avoir découvert, je ne me lasse pas de lire vos explications, et vos realisations sont des bijoux! Vous êtes une brodeuse hors-pair vos doigts sont magiques à moins que de malicieux lutins s’ingenient à les ensorceller!!! bonne semaine à vous, Bruno. Hi Mary, I share your passion for gimp, silk and gold that’s probably why I do like your side. A big thanks for all the interesting tips and ideas. What a wonderful artist you are! May I ask a dumb question and ask what you couched the silk gimp down with when it was the couchee? This thread sounds like fun. Maybe new techniques. Of course, couching comes to mind. Thanks for the tutorial. I’ll have to see if my local needlepoint shop will be carrying it. Thanks. Thank you for this very precise description for the gimp thread – I found your site through google – I am living in a nearly stitching dessert so I am thankfully learning new things. Wow, thanks for this post. I spin yarn. That said, Gimp is a form of what is called “core spun” or yarn spun around a core. My mother knitted with gimp and I was fascinated with it; Recently I saw online, an evening bag crochet from silk gimp for over $1,000. I’m going to spin some silk gimp and would like to know why it is important to use a silk core, as this makes it expensive. Is it preference, or a matter of laundering, or flexibility? 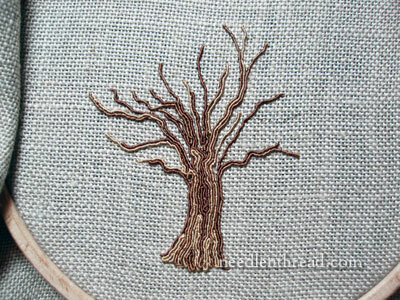 I am very excited and I’m a new embroiderer and I saw how you made this tree using silk gimp. can you tell me what method you used to make this Tree.you said some something about couching? Thanks for this article. I am an experienced stitcher but was unfamiliar with silk gimp or burden stitch. Your website was recommended by a friend and I find much useful information on it. I love your work Mary, I am into embroidering trees and just started to learn some of your wonderful techniques.